We've repeatedly seen teams get anywhere from +20% to +400% more done during a round of Work Cycles — as well as permanent lessons learned. We'd be delighted to run a free round for your team. Yes, really. That's getting the equivalent of two days of work done in a single session. You've probably experienced this phenomenon yourself — when everything is just clicking. That's what Work Cycles aims to help your team do... and what Cycles has already succeeded in doing, repeatedly, for top teams worldwide (including being popular with team members at places like Google and NASA). 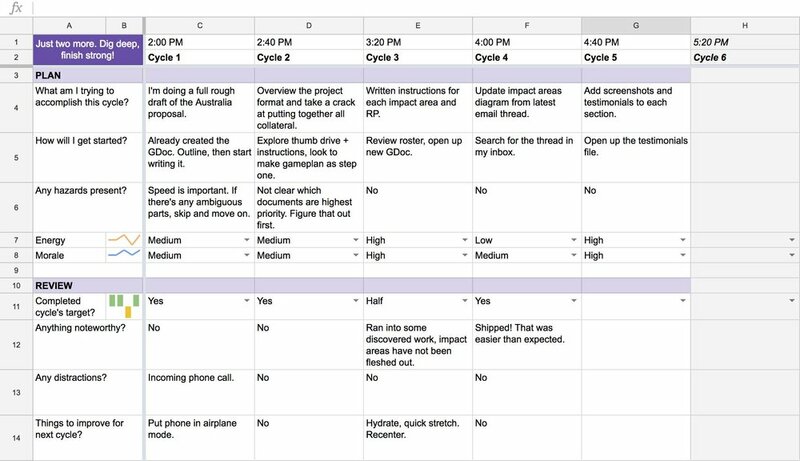 Now — we'd be delighted to do a round of Work Cycles, for free, for your team. If you're reading this, you're probably already doing incredibly well — growing and scaling up your company. We're looking to connect more with companies like yours, and thus, we'd be delighted to do a round of free Cycles with you. Your team will get more done than they thought possible in a session, get some permanent lessons, and have fun in the process. And we’re doing it for absolutely free. Why? We think it’s cool. These are amazing concepts we’re excited about and getting to share them with ambitious people is great. It lets us meet some very cool people. You know, most just aren’t interested in things like that - if you’re even reading this, you’re most likely someone we’ll really get along with. We'd be delighted to get to know you and have some peak performance together. Maybe you’ll love it so much, you’ll want more and become our customer, or tell all your friends about us. It’d be super cool if you became a customer or spread the word about us — but hey, not required, let’s have a really exciting session either way where your team gets peak performance and we have a great time together. The goal with Work Cycles are to help your team fire on all cylinders during a single session of work — getting into flow state, being un-distractible, and working with a mix of structure and accountability that's proven to result in getting a lot done while feeling great in the process. I was pleasantly surprised with my performance — at least 3x more productive than normal. I’ve read about productivity best practices and implemented some of them before, but you have to try something like this to really experience the benefits. The core idea behind Work Cycles is that there's around two dozen best practices for having a good work session. We've spent a lot of R&D time studying peak performance, industrial engineering, sociotechnical systems, and working with elite individual performers and teams to roll as many best practices into a work session as possible. So, what's needed to do this? 1. We'll block out the best time for your team to run Cycles. 1PM-5PM is particularly popular, since most people aren't as productive in the afternoon as the morning — and you'll be surprised at how much you can get done. But we're flexible on time; we could do the morning or evening, or weekends, depending on your team's preferences. 2. Have everyone bring work they want to accomplish! This isn't some "blah blah blah" theory — there's a very short setup and some instruction on best practices, followed by a guided work session where everyone gets a lot done. 4. Everyone shows up, gets a ton done, learns some lessons, and has fun in the process. That's it — the rest is just details. If you're curious about the methodology and what goes into it, you can read more about Work Cycles and check our templates and instructional videos at this link — but that's not necessary to get started; we'll have one of our instructors run your team through everything. Actually, our CEO Sebastian Marshall is particularly fond of hosting these, and pending availability, you'll likely be working with him or someone else senior. We really, really like Work Cycles here at Ultraworking. During the actual session, your people will set up on best practices, plan out their sessions, and then work in 30/10 blocks — 30 minutes of focused work, followed by 10 minutes of debrief and analysis along with a break. You might be downright shocked at how much everyone gets done. The biggest thing I realized is that when I focused during Work Cycles, I can get a workday done in 3 hours... By getting the work done in disciplined cycles, that then frees me up to work on bigger things, as well as showing me where I was wasting time in the past. Who is this for? Should we do it? Cycles are outstanding for two types of work — first, boring rote type work that you just want to get done quickly, like getting a batch of email answered, or all accounting done, and things of that nature. Second, deep creative and strategic work in marketing, sales, management, programming, and inventing. As a programmer when I first heard of cycles I had some reservations. But after some real world experience, I went on to realize that if your tasks aren't divided into small enough pieces that they fit within 30 minutes, you probably don't know the problem well enough. So now I'm sold on using cycles for programming - it's saved me from a lot of wasted time and effort. Running Cycles for your team will be a cool event where people get a lot done and learn a lot in the process. There's no strings attached and no catch. If you think it's particularly amazing and want to work with us in the future, fantastic. If you just have a single great session with your team, have everyone get a lot done while learning some lessons, and have fun in the process — also fantastic. Actual round of live Work Cycles on Zoom. The accountability and shared experience of working alongside other people is conducive to flow state and peak performance. We'd be delighted to do a round of Cycles for your team — and we're going to look to make it some of the most fun and impactful hours you spend this year.